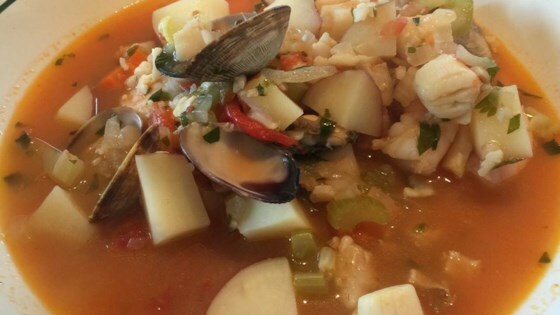 "Cioppino. Excellent recipe. One of the easier recipes and a very good one. Love fish stock over clam juice. I used more fresh parsley on slices of French bread with garlic butter." Heat olive oil in a heavy large Dutch oven or large pot over medium-high heat; cook and stir onion until translucent, about 5 minutes. Add garlic to onion; cook until garlic is fragrant, about 2 minutes. Stir 1/4 cup parsley, basil, oregano, red pepper flakes, and bay leaf into onion mixture; cook and stir until fragrant, about 1 minute. Add wine to seasoned onion mixture; bring to a boil. Cook and stir mixture until most of liquid evaporates, about 10 minutes. Pour tomatoes with juice and fish stock into seasoned onion-wine mixture; simmer until flavors blend, about 15 minutes. Season with salt and pepper. Stir mussels into tomato mixture; cover Dutch oven with a lid and simmer for about 2 minutes. Add clams to mixture; simmer about 2 more minutes. Add halibut, scallops, and crab legs to mussels-clams mixture; cover Dutch oven and simmer until mussels and clams break open and halibut and scallops are cooked through, about 2 more minutes. Add shrimp to cioppino and cook until heated through, 1 to 2 minutes. Discard any mussels or clams that didn't open. Divide cioppino among serving bowls; sprinkle with 2 tablespoons parsley. If you use fresh herbs, double the amounts. For the dry white wine, I use fume, chardonnay, or Chablis wine. Clam juice can be used in place of fish stock. It is better to buy a fish base. They sell an excellent base at Market Street. It will last forever and it is a very nice tasting base for any soup. Precooked crab legs need to be cracked and set aside along with the shrimp in the refrigerator. Add them at the last 4 or 5 minutes of cooking. They only need to be heated through and will get tough if cooked too long. I used the mixed bag of frozen fish from Sam's club and frozen cod cut in chucks and extra shrimp (lg) 21-30 oh and couldn't find fish stock so I used clam juice. The picture provided with the recipe seems to show celery and potatoes, but there are none called for in the recipe? What gives - is it the wrong photo, or is the recipe missing ingredients?